All the news that's fit to Gingrich? All is fair in print and digital. 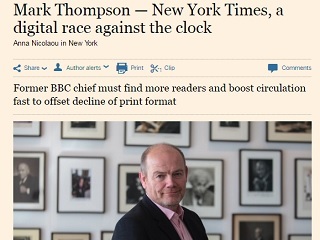 Mr. Thompson is keen to preserve the NYT heritage and its physical paper, which he says will be printed for “a long time to come, a decade or more”. He rejects any notion that the NYT could go down the path of Tribune Publishing, the 169-year-old owner of papers such as the Los Angeles Times, which in June changed its name to Tronc as part of an effort to jolt its ailing business. He quips that the NYT is “pretty happy with the name we’ve got”. Thompson’s brainstorm about a Tronc-like New York Times name jives with the way Joe Pesci’s character Vinny Gambino famously pronounced “youth” in My Cousin Vinny. That film was released in 1992, when media companies were not yet feverishly obsessed with how to connect with millennials, in New Jersey and beyond. Read the rest of the FT interview here.